And so another year has ended and a new one begins. I confess that, while on a personal level 2019 holds good promise, the bigger picture seems to me to promise many worrying and difficult things. It comes to something when my most optimistic hope for our country and the world is that 2019 turns out to be less awful than I fear. And yet. Still we continue to live our ordinary everyday lives, and so we should – always in the best ways we can manage. Last year I adopted (and used) a phrase that appealed greatly to me: Do what you can with what you have. It served me well, and I plan to use it again throughout 2019. Alongside that (and always with reference to it), this year I’ve decided to set myself several specific goals. I plan to use this space (and you!) to hold myself to account, and I’ll be able to drop back here at the end of December to see how I did. My goals are simple and not in the least novel. Some of them are goals I’ve set myself several years running and always failed to meet – hence my plan to dust them off and bring them into the light of day, figuring that maybe I’ll be more likely to stick with it if I know that you’ll be watching to see how it goes. My experience has been that when I do that, I have a greater ability to stick with it. Time will tell. Do some sewing. Not sure what. Anything will be more than nothing…. As goals go, I’d say they’re pretty modest. Though I may not think so this time next year. I’ve tried to keep them specific, so if I fail it will be clear that I’ve failed. Of course I could lie to you, but I won’t be able to fool myself so what would be the point? Maybe you’d like to join in alongside me with some or all of these? That could be more fun for both of us. 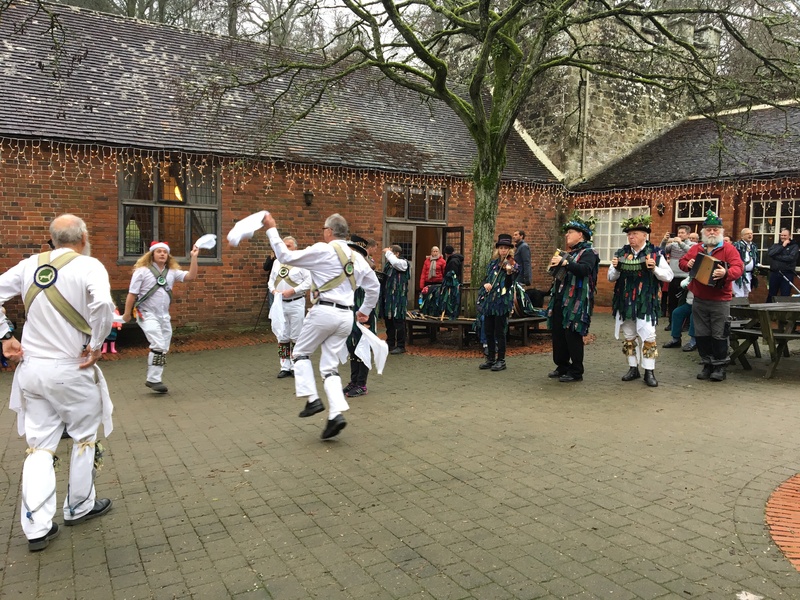 Here, for no reason other than this was what we saw when we went to Stourhead for our Boxing Day walk, are some Morris Dancers (traditional English folk dancing, for those who live elsewhere and maybe haven’t come across this before. If you’d like to see more, click here to enjoy Malcolm’s video clip. These are the White Horse Morris, a Wiltshire side. (Not many people know that when I was a student I was part of a women’s Morris side. I can still remember most of the dances. If there was a mixed side nearby I might even be tempted to join them, but the only one I can find is a women’s side that wears soppy costumes. Not for me I’m afraid). This entry was posted in Climate change, Do what you can with what you have, Reflections on life (and death), Uncategorized and tagged Living, New Year, New Year goals, Reflections, Simplicity. Bookmark the permalink. Thank you so much – and you too Jackie! Happy New Year! Such a good idea to track your progress in achieving your goals for 2019 on your blog (in recent years I’ve gone down the guiding word route). Good luck! Thanks Liz! Happy New Year to you too. I’m really enjoying reading your blog posts. Don’t comment as often as I should. Happy New Year, Deborah 🙂 . It probably goes without saying that I, too, find the state of the world to be very worrying. And yes — and yet — we still have to keep putting one foot in front of the other as best we can. It helps knowing there are other like-minded people out there, all of us seeing what’s going on and still trying our best. 1) Less single-use stuff. For me, this will be a continuation of my goal to become as close to zero-waste as possible. I’ve tackled all the “usual” single-use stuff, and would love to be able to generate no waste at all. It’s difficult to do in a small city in Canada, but I’m making strides and am planning to do more. 2) Get my garden back to how I want it to be. Last summer, I planted the veggies and then relied entirely on my husband to keep things going. I’d really like to do a better job with this. 3) Do some sewing. I want to sew a couple of lightweight sleeveless shirts in the next few months. Last summer I hit upon a flattering pattern — it’s amazing, the difference I feel when I’m dressed “appropriately” (for my age, for my figure) — and I’d like to add a few more pieces so I can retire some items that I really should not be wearing anymore. Yes, I’m hoping that our granddaughter will be just the spur I need to get back to sewing. My first two projects are to sew a cot cover for her, and to make her Christmas stocking that didn’t quite get done for Christmas. By next year I’m sure she’ll be joining with us on our (modest) gift exchanges. I’m also looking around for a sewing class to go to, hopefully with my sister. All my good wishes to you too for a Happy New Year – and I hope one where you find a comfortable equilibrium for yourself between caring a lot about how things are, and allowing the limits to what you can do to change it as just one individual. Thank you so much Dar – and you too! I’m still having problems commenting on some blogs, but am trying to figure it out. Am still enjoying reading your posts, and looking forward to whatever this year throws at us (well, mostly, though our internal politics seem to get more surreal and bizarre by the day right now). Oh and you too Kathryn! I know what you mean about fear of flying – to be honest it always terrifies me. I only do it as a means to an end – literally, but also it’s the only practical way to visit my dear friends now that the overnight trains have been cut. On the other hand, when I’m doing it I manage both to be very scared (and convinced I will die) but also marvel at and enjoy the views. Anyway, good luck with overcoming your fear, and I’m sure that your trip will be amazing. Looking forward to hearing about it in due course.